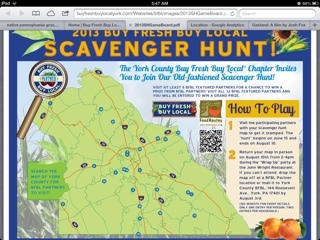 It's time for the York County Buy Fresh Buy Local Scavenger Hunt! Starts today. Download the map. Visit local food venues: farms, restaurants, wineries, apiaries, coffee roaster, bakeries, farmers markets! Today is the kickoff with Tastes Of York at Millers Plant Farm. For $10 you can meet local food producers and try out some goodies! There will be printed maps with detailed instructions for the scavenger hunt too!